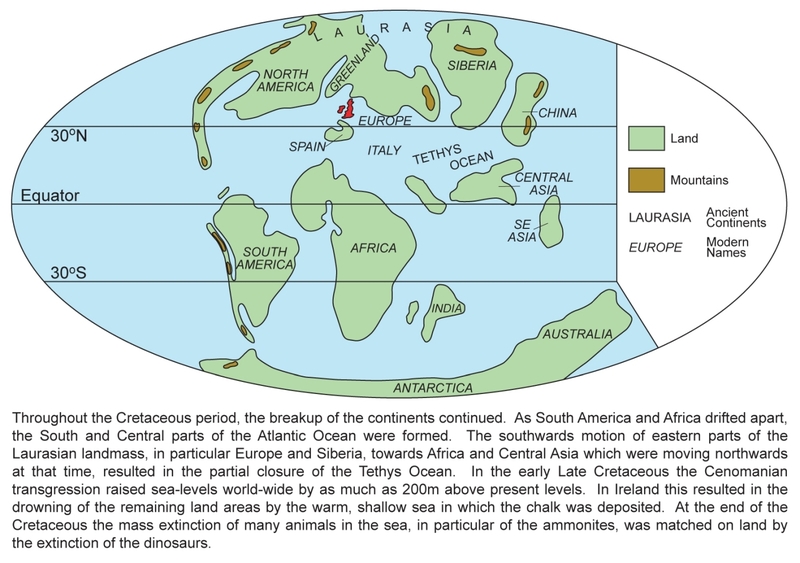 Throughout the upper Jurassic and Early Cretaceous, the break up of the supercontinent Pangea continued. In the Southern Hemisphere, South America drifted westwards away from Africa while north of the equator the proto-North Atlantic Ocean continued to widen . During the Early Cretaceous, Ireland was represented by a landmass of uncertain extent and the absence of Cretaceous strata may indicate a period of non-deposition that possibly started in the late Early Jurassic (see Jurassic article) , and extended for 90Ma to the early Cenomanian. 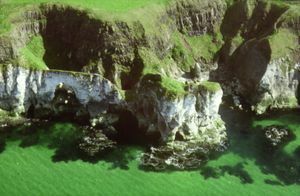 However, in the early Late Cretaceous a widespread rise in sea level, the Cenomanian transgression, advanced across the margins of the former land areas and was followed by warm, clear seas that ultimately may have covered much of Ireland (P947854). In Northern Ireland, the outcrop of Late Cretaceous rocks is located at the margins of the Antrim Plateau, primarily in Counties Antrim and Londonderry (P947855). During this period the impact of tectonic activity was varied across Northern Ireland. In the east and south the sub-Cretaceous unconformity rests on Late Triassic or Jurassic rocks whereas in the west the unconformity progressively oversteps the entire Triassic and Carboniferous succession to overlie the Ordovician rocks on Slieve Gallion [H 813 896]. The Late Cretaceous depositional basin covered the Dalradian outcrop in northeast Co. Antrim and may also have extended over much of the eastern Sperrin Mountains . The Cretaceous rocks are divided (P947942) into the Hibernian Greensands Formation  and the Ulster White Limestone Formation . 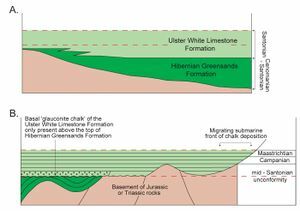 The restriction of the Hibernian Greensands Formation to the south and eastern fringes of the Antrim Plateau between Lisburn and Glenarm, with a small area east of Limavady, is the result of episodes of regional uplift and erosion during and after its deposition. In contrast, the Ulster White Limestone Formation occurs throughout the Cretaceous outcrop and is exposed in spectacular coastal sections and in several quarries (P948011). 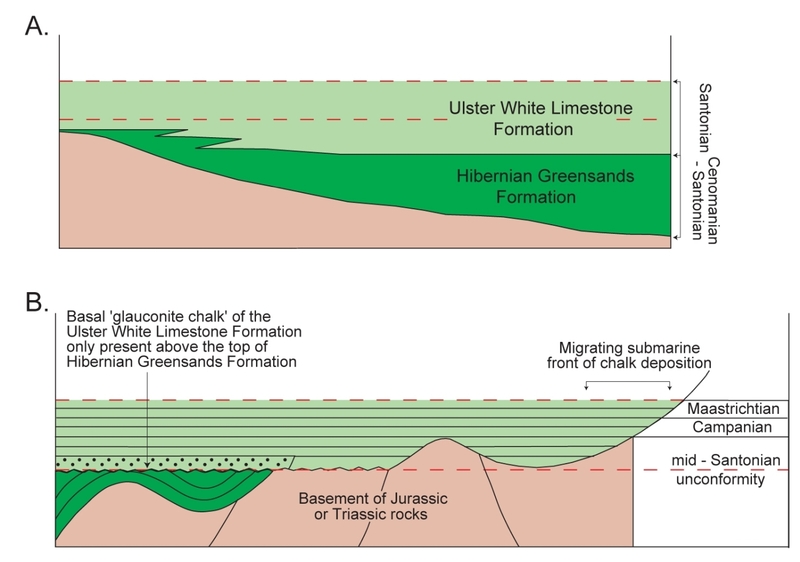 Four members are recognised in the Hibernian Greensands Formation   and fourteen members in the Ulster White Limestone Formation.The use of the lithological term limestone in the Ulster White Limestone Formation is replaced in all but one of those members by the term chalk, which has an age connotation and by implication is Late Cretaceous. The Late Cretaceous rocks in Northern Ireland are equivalent in age to the Chalk Group in England and make up one of the most complete and best-exposed post-Santonian sequences in Northern Europe. 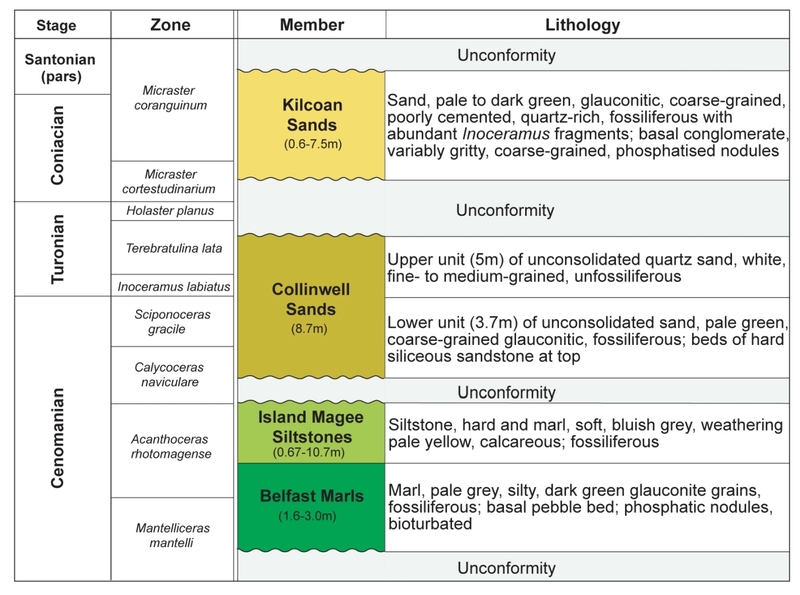 Although a complete succession is not exposed at any one locality, lateral thickness variations in individual members are determined by the presence of marker horizons, particularly in the Ulster White Limestone Formation. On this basis, it is possible to define the distribution of depositional basins and structural highs and to identify syndepositional basement controls. The limestone of the Ulster White Limestone Formation is extremely hard compared to much of the rock of the English Chalk Group. This is due to secondary calcite cementation in pore spaces with the calcite being derived from pressure solution during compaction . The Irish chalk has a much higher density (2.60 compared to 1.95) and lower porosity (5% compared to up to 50%) than the English Chalk Group. Deposition of the Late Cretaceous sediments was strongly influenced by contemporaneous tectonism and the control of Caledonoid basement structures on the location and extent of depositional basins (P947856). Although the main depositional basins occur on opposite sides of the Dalradian Highland Border Ridge, areas of minor subsidence and uplift within them created localised basins and attenuated successions. 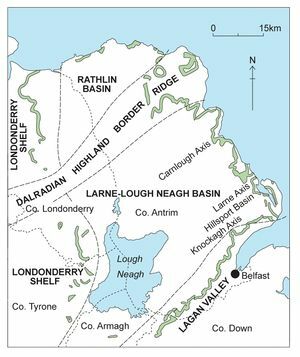 However, by late Campanian times (P947942) land areas in the west were submerged by the transgression and in the process created the Londonderry shelf. Within the Hibernian Greensands Formation, a major unconformity separates the lowermost three members (Cenomanian-Turonian) from the upper member of Coniacian-Santonian age (P947943). More controversial however, is the nature of the junction between the greensands and chalk. One model envisages a diachronous relationship at the margins of a subsiding chalk basin ( (P947857)A) but a more likely scenario is an unconformity. Glauconite and detrital sand in the basal unit of the chalk was thus derived by erosion of the Hibernian Greensands Formation ( (P947857)B). ↑ 2.0 2.1 Reid, R E H. 1971. The Cretaceous rocks of north-eastern Ireland. Irish Naturalist’s Journal, 17, 105–29. ↑ Griffith, A E, and Wilson, H E. 1982. 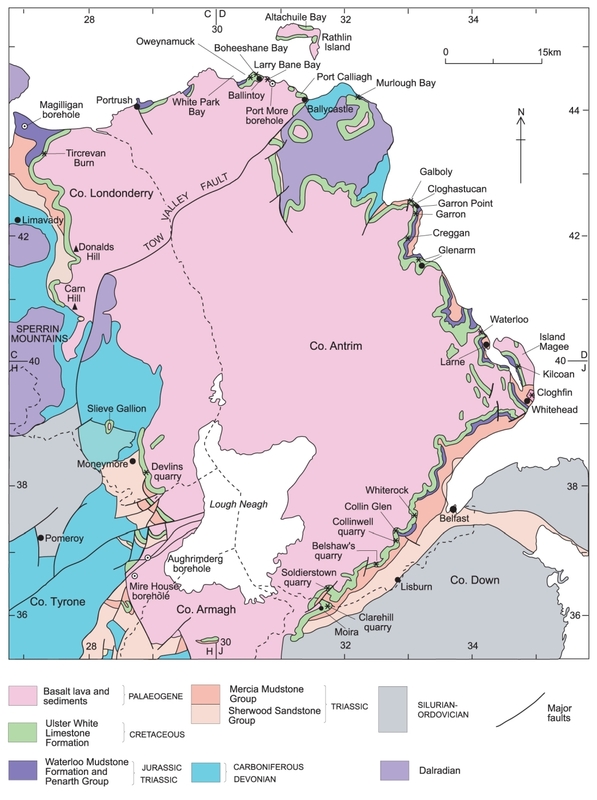 Geology of the country around Carrickfergus and Bangor. Memoir of the Geological Survey of Northern Ireland, Sheet 29 (Northern Ireland). ↑ 4.0 4.1 4.2 Fletcher, T P. 1977. 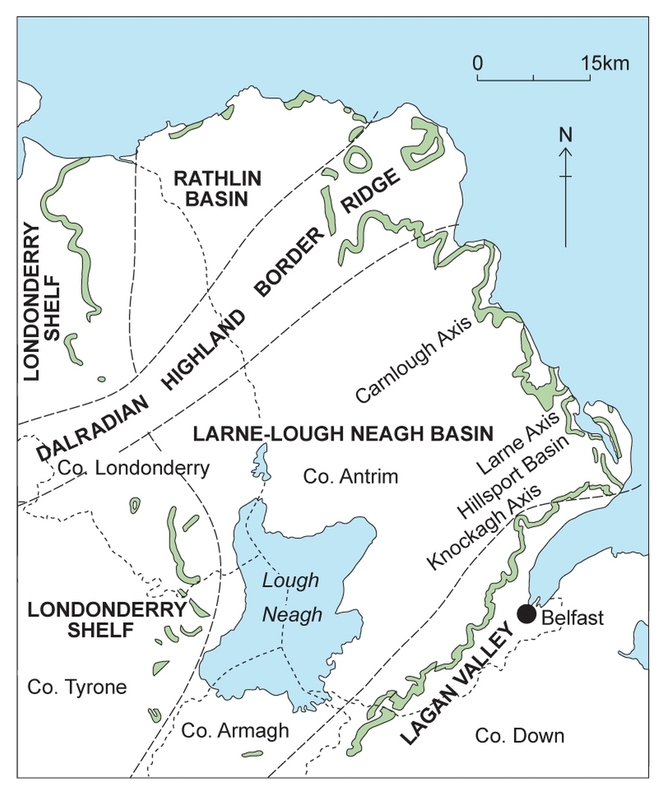 Lithostratigraphy of the Chalk (Ulster White Limestone Formation) in Northern Ireland. Report of the Institute of Geological Sciences, 77/24. ↑ Portlock, J E. 1843. Report on the geology of the County of Londonderry and parts of Tyrone and Fermanagh. 784pp. (Dublin: HMSO). ↑ Wolfe, M J. 1968. 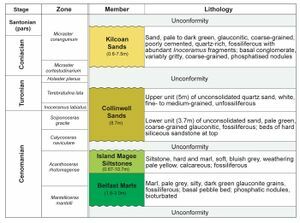 Lithification of a carbonate mud: Senonian Chalk in Northern Ireland. Sedimentary Geology, 2, 263–90.